Another busy day crafting! So many beautiful colours in this card, you can’t take your eyes off it! It is bold and bright. 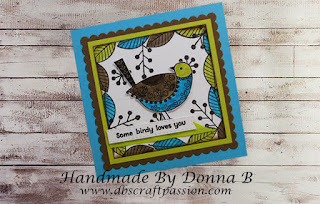 It is always nice to send someone a card, especially by telling them 'some birdy loves you'. Do you know someone special who would love to receive this? Thank you everyone for viewing my blog, please follow to keep update on my daily posts!